Since for ever, people have wanted the iPhone to be on a different carrier in the US rather than AT&T, mainly Verizon. We probably won't see the iPhone on Verizon until they launch their LTE network and Sprint seems to be not interested in the iPhone. But what about T-Mobile? 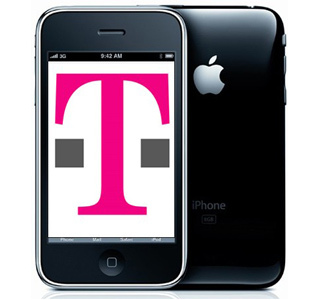 Well, like AT&T, T-Mobile's network is GSM so Apple will not need to put a CDMA radio in the iPhone. But they will need to change the 3G bands so it will work on T-Mobile's network. Well on to the rumour. Cult of Mac is reporting that a "highly placed source" at T-Mobile told them that there is a 80% chance of T-Mobile getting the iPhone in Q3! I know, a weird time for Apple to release a T-Mobile version of the iPhone, and we don't know if this source is even credible or what it is based on. The biggest evidence of this actually happening, is the statement from Deutsche Telekom's CEO in March, saying that "the USA branch is hoping to get the iPhone later this year".